When I was younger, there was a certain website that I’d check almost religiously. Over time, I detached myself from the writer, but still subscribed to the RSS feed which would tell me when a new post was up. Recently, I had a purge of all the unwanted and forgotten feeds in my Google Reader. I deleted this one as well, since it was infrequently updated, and irritated me in tone. Quite accidentally, I ended up on that website yesterday (thanks, so called “awesome” bar.) My first though was that I was pleased with myself for forgetting about that blog. The second – that I had never lost anything from no longer knowing the writer. I see the writer sometimes as I walk home from work. I smile and look the other way. 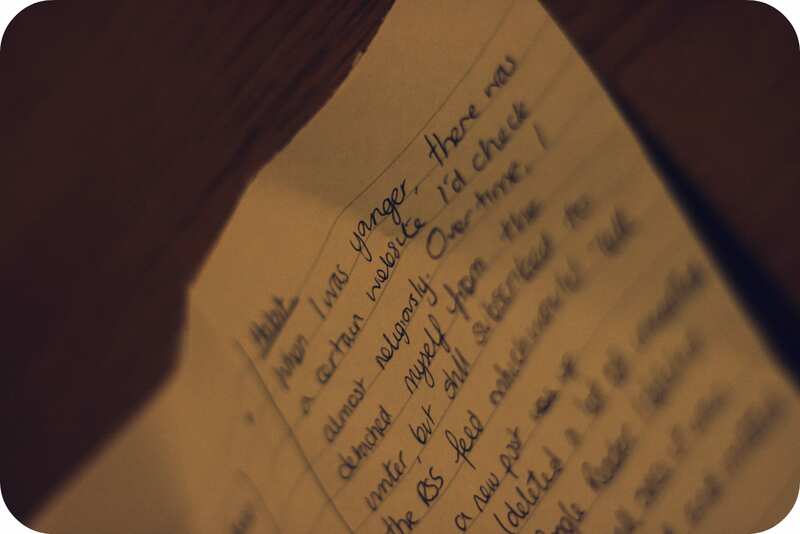 This blog post was hand written first, as a means of getting the thoughts out of my head. I didn’t really think I would publish it at first, so apologies for this post, which isn’t the sort of thing you normally expect. I’ll post some shoes tomorrow, OK?